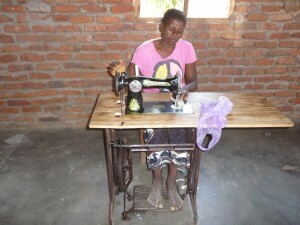 In 2012, the board of KM decided that a sewing business would be a good addition to the businesses that have been started at the orphan project. During the July, 2012 trip to Malawi, Immanuel Lutheran Church (Crosby, MN) donated money to purchase two treadle sewing machines and for training for the women on how to sew. As of 2017, the women are still learning the sewing skills which they will use in this business. For now the women are tailoring and repairing items for people in their community. Most formal clothing in Malawi is tailor made. Eventually, they may sew purses, decorative pillows and other household décor items from Malawi fabric that could be sold in the US. Some of these items may incorporate the embroidery done by other women.